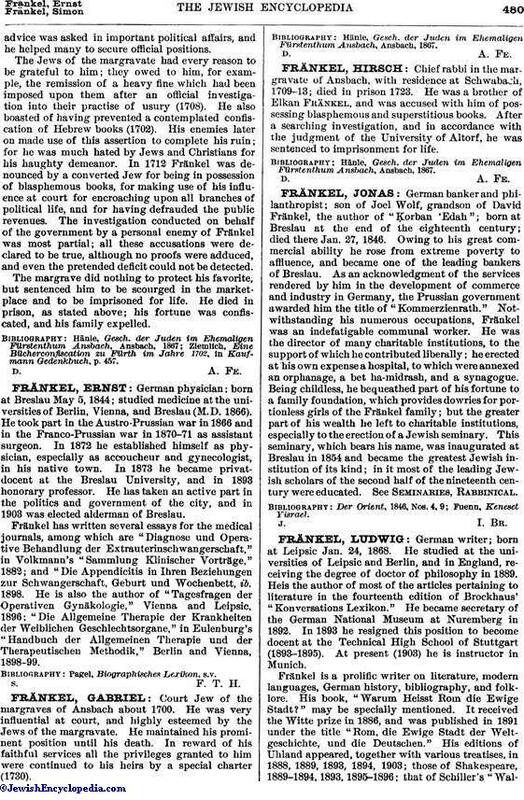 German banker and philanthropist; son of Joel Wolf, grandson of David Fränkel, the author of "Ḳorban 'Edah"; born at Breslau at the end of the eighteenth century; died there Jan. 27, 1846. Owing to his great commercial ability he rose from extreme poverty to affluence, and became one of the leading bankers of Breslau. As an acknowledgment of the services rendered by him in the development of commerce and industry in Germany, the Prussian government awarded him the title of "Kommerzienrath." Notwithstanding his numerous occupations, Fränkel was an indefatigable communal worker. He was the director of many charitable institutions, to the support of which he contributed liberally; he erected at his own expense a hospital, to which were annexed an orphanage, a bet ha-midrash, and a synagogue. Being childless, he bequeathed part of his fortune to a family foundation, which provides dowries for portionless girls of the Fränkel family; but the greater part of his wealth he left to charitable institutions, especially to the erection of a Jewish seminary. This seminary, which bears his name, was inaugurated at Breslau in 1854 and became the greatest Jewish institution of its kind; in it most of the leading Jewish scholars of the second half of the nineteenth century were educated. See Seminaries, Rabbinical.